The advanced, effective and proven in action, high-quality supplement to build muscle mass for strength athletes, strength endurance and strength. The ideal way to rapid weight! 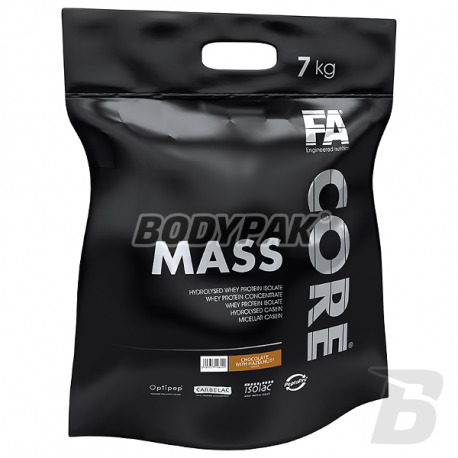 FA Mass lined Core® is a high-quality classical, effective and proven in operation supplement to build muscle mass for athletes, strength-endurance. FA Mass is the latest generation product for the preparation of a nutritional drink a protein-carbohydrate to meet the needs of the human body during intense physical activity especially in athletes. FA Mass is a multi-component and complete conditioner that provides everything to ensure you adequately rapid muscle growth in combination with a suitable weight training. 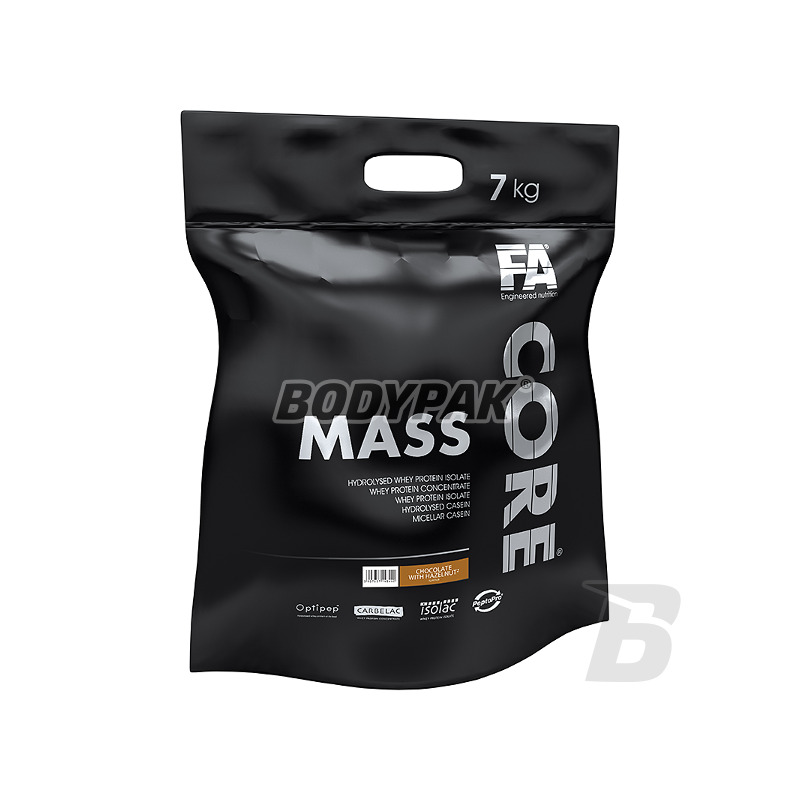 Each serving FA Mass CORE provide 40 g of full proteins supporting the growth and maintenance of muscle mass, di- and tripeptides and free amino acids derived from the hydrolyzed whey protein (Optipep ™) and casein hydrolyzate (PeptoPro®), and whey protein isolate (Isolac® ). In addition, each portion of the product is contained 136 g of carbohydrates (simple and complex, including Vitargo®), which are the primary source of energy for working muscles, which prevents burning and the use of protein for energy needs. Whey protein concentrate WPC and most versatile protein, taking into account the time of application and the length of absorption. Podsiad slightly longer time needed to completely digest of approx. 2-3 hours. and a slightly longer time required for the initiation of the etching process approx. 30 min after ingestion. This is the basic building blocks of your muscles, which protects the body's anabolic state. WPI whey protein isolate, whey protein fraction which is subjected to micro and ultrafiltration, which yields the highest degree of concentration of protein in the product (over 90%). It has the highest content of branched chain amino acids as much as 25 grams per 100 grams! Furthermore, it comprises carbohydrates and lipids. Together with Optipep ™ effect on increased insulin response of the body after ingestion. The pre-digested enzymatically whey isolate in the form of two- and tri-peptides containing the protein in an amount of 90 g per 100 g. Hydrolysis of whey isolate is a pre-digestion of the isolated protein which is no longer requires "cutting" it to the free amino acids by the body in order to be assimilated. Hydrolyzed casein derived from milk. Currently, one of the most fraction of protein supplements on the market, characterized by a very high quality, fast absorption and aminogramem typical casein. PeptoPro® is a patented and proprietary formula that uses enzymes that make the product stripped sour taste characteristic of hydrolyzed products. High molecular carbohydrate derived from barley starch or corn. Carbohydrates of high molecular weight similar to its structure glycogen molecule, which confers a characteristic viscosity, when dissolved at the same time ensuring a high efficiency of energy helping athletes. It is thanks to its structure, high molecular carbohydrates release of the glucose molecules of the side chains in the first minutes after ingestion, and this effect is maintained long-term by further release of glucose from the backbone. Składniki: Kompleks węglowodanowy (maltodekstryna, glukoza), kompleks białkowy [koncentrat białek mleka, koncentrat białka serwatkowego (Carbelac®), maślanka, izolat białka serwatkowego (Isolac®), zhydrolizowany izolat białka serwatkowego (Optipep™), zhydrolizowana kazeina (PeptoPro®) (z mleka)], kakao1, substancja zagęszczająca (guma ksantanowa), koncentrat soku buraczanego7, aromaty, barwniki (karmel1,2,3, beta-karoten3,4). Dotyczy produktu o smaku: 1Czekoladowy, 2Czekoladowy z orzechem laskowym, 3Toffi, 4Bananowy, 5Waniliowy, 6Waniliowo-migdałowy, 7Truskawkowy, 8Biała czekolada z kokosem. Gainer ktory "robi robote". Jako genetyczny ektomorfik udalo mi sie przytyc 8kg po 4 miesicach stosowania, czyli "ksiazkowe" 500g na tydzien pijac 2x dziennie. Dodatkowo stosowalem urozmaicona diete (moja zona jest dietetykiem) i jadlem inne suplementy. Smak wanilia-hazelnut taki sobie, rewolucje zoladkowe sie zdarzaly. Moge polecic wszystkim "chuderlakom" jako podstawa do budowania masy. Bardzo dobry stosunek jakości do ceny. Dobrze rozpuszczalny. Nie pieni sie prawie w ogóle. Przy spożywaniu dużych ilościach w ciągu dnia zamula. Dobry jako zamiennik posiłku. Smak czekolada - orzech nie nudzi sie nawet po miesiącu. Skuteczność też prawidłowa. Waga rośnie w zauważalnym tempie. Problem w tym, że wychodzą pryszcze na plecach i ramionach co jest niekomfortowe. Smakuje super, przez niecałe 2 miesiace używania - przytyłem ponad 2kg. Smak biała czekolada-kokos jest naprawd/e dobry, chociaż nudzi sie po dłuższym użytkowaniu, polecam wziąć inny. Jedyny problem, to gaz, ale to podobno norma i ustaje po jakims czasie :). NIE PIJECIE PIWA(Nawet 1) PO ZAŻYCIU GAINERA! The taste is excellent, and the consistence is good too, it's a bit thick. Best mass gainer I've tried out so far. Can recommend the chocolate flavor. Przy dobrej diecie naprawde fajnie wspomaga. Zjadłem prawie 3kg zawsze mieszając z jedzeniem (płatki, biały ser, owoce, itp) i jestem bliski powrotu do formy sprzed 2lat! Problemy gastryczne jak u kolegi. Pierwszy tydz. tragedia ale mimo to bardzo dobry produkt. Nie ma sie do czego przyczepić. Produkt idealny, bardzo dobrej jakości! Smak czekolada-orzech chyba nie może się znudzić. Orzech jest tam bardzo mocno wyczuwalny, taka troche czekolada milka orzechowa, tylko że w płynie :D rewelacja - polecam, bo efekty też niczego sobie!! Bardzo dobry gainer z niewielkim dodatkiem tłuszczu, z zawartością świetnej jakości vitargo. W tej cenie jeden z lepszych, dostępnych na rynku!